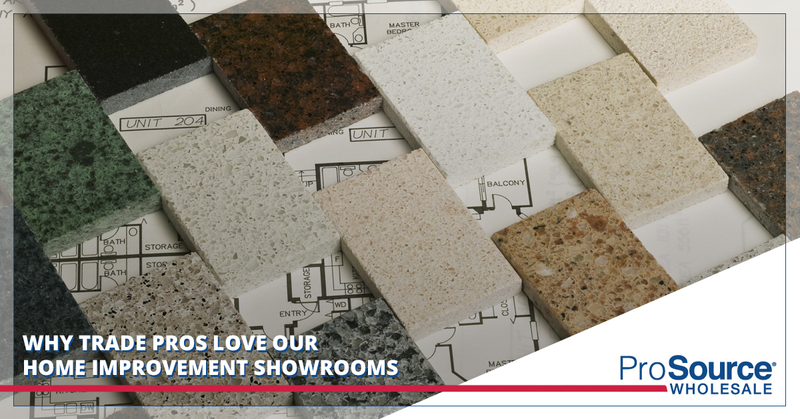 One of the many benefits of a ProSource® showroom is its reputation of excellence among trade professionals. Leaders in the home improvement industry look to our unique franchise as an excellent resource they can rely on to ensure they deliver incredible results to their clients. Trade pros love to be members of our exclusive showrooms, and it isn’t hard to understand why. In this blog, we will go over the top reasons why we are the favorite home improvement franchise of trade pros. ProSource is the largest trade-only wholesale home improvement supplier, which means that our selection can’t be beat. For trade pros, visiting a ProSource showroom is a lot like being a kid in a candy store. We offer more than 50,000 products, which can (understandably) be overwhelming. Fortunately, with access to an experienced ProSource account manager, we can help our members navigate the latest trends that will thrill their clients. Not only do we have an extensive collection of products, we ensure that everything we sell is high quality. We work with trade professionals who specialize in both residential and commercial spaces, so we make sure we have a selection of quality materials that will fit seamlessly into any space, whether it’s a small condo or a large office building. It’s an insider secret in the home improvement industry that a ProSource membership is essential to accessing the “good stuff,” and we enjoy this status. There is nothing as frustrating to a trade professional than trying to squeeze through the public home improvement store around giant crowds of people. Trying to get good customer service in these conditions is nearly impossible, not to mention, the products leave a lot to be desired. When a trade pro is a member of ProSource, however, they don’t have to concern themselves with these conditions. Instead, they are given exclusive access to tens of thousands of high-quality products where they can freely move about, learn about everything we offer, and take their time to truly think through their investment. The members-only set up of our showroom ensures that trade pros have the best possible experience shopping for their materials. When trade pros are ProSource members, they have access to the top brands of home improvement products on the market. While the retail prices of these materials are out of budget for many clients, our wholesale prices ensure that these gorgeous products are accessible to a larger audience of people. When trade pros are looking for a good deal on home improvement products, whether its tile flooring or sink fixtures, they know they can trust ProSource to offer the best price in the market. At ProSource, we are invested in the success of every project our trade pros bring to us. We want the client to be happy with the results just as much as they do. When trade pros are members of our showroom, they know that they will form a personal connection to an account manager who will be there with them every step of the way to make sure everything meets the client’s expectations. We are dedicated to building strong, lasting relationships with trade pros, and we accomplish this by always going above and beyond to provide exceptional service. With our level of expertise, trade pros know that they are making decisions based on the most accurate information out there. Every franchise owner and showroom staff member is thoroughly educated and trained so that they can be the expert resource our trade pros need in order to successfully complete their projects. We know pretty much everything there is to know about home improvement, and if we don’t, we will diligently seek the necessary answers. Are you ready to provide the high-quality products and amazing customer experience to a list of members exclusive to your showroom? At ProSource, we offer a home improvement franchise opportunity that cannot be compared to others. With low overhead operating costs, no installation services, no accounts receivable, no retail hours, and an exclusive, members-only showroom, you won’t find another franchise like it. If you’re qualified and interested in this opportunity, contact us.